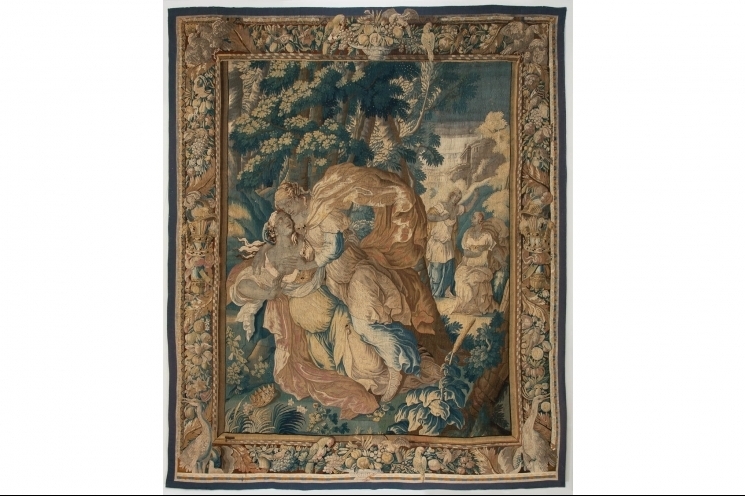 Baroque mythological tapestry, Aubusson, France circa 1690, after a cartoon by Isaac Moillon (1614-1673). 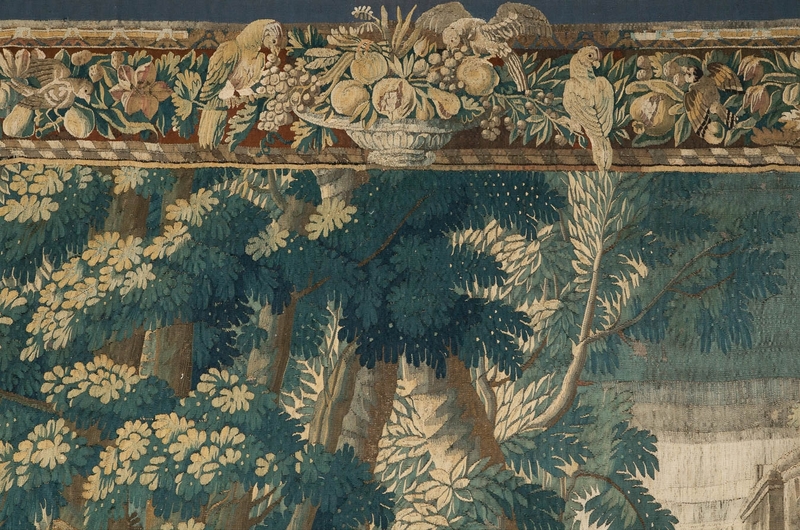 Finely woven in the Flemish style with a rich border of fruit and birds, in wool and silk. 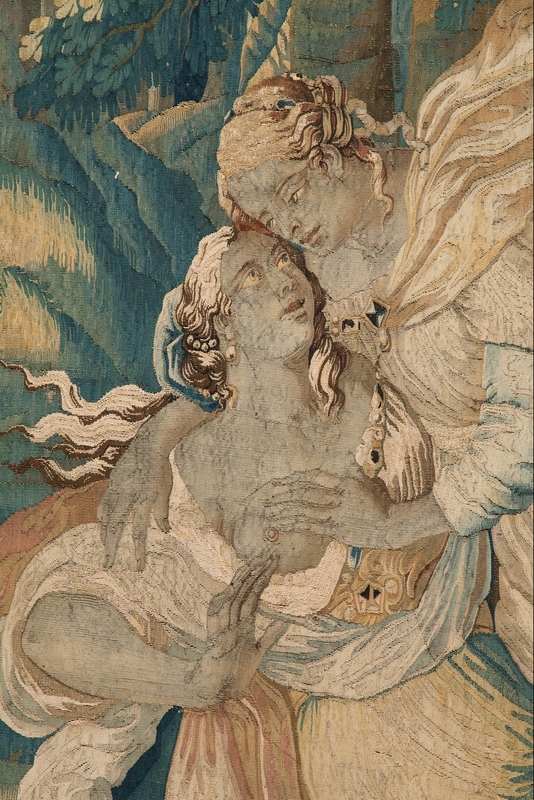 Depicting a scene from Greek mythology, Achilles seducing Deidamia from the collection of tapestries The History of Achilles. 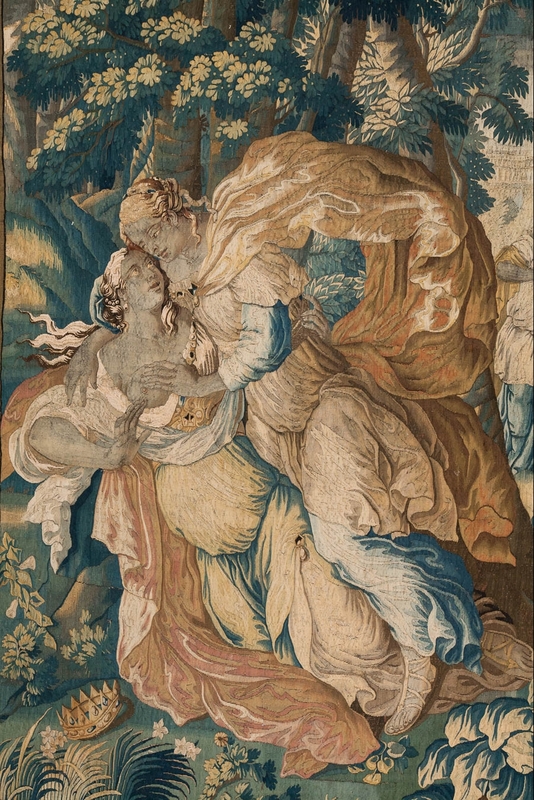 During the Trojan wars Thetis changed his son Achilles into a girl, Deidamia was one of King Lycomedes's seven daughters with whom Achilles was concealed. Some versions of this story state that Achilles was hidden in Lycomedes's court as one of the king's daughters, some say as a lady-in-waiting under the name "Pyrrha". Despite the fact that Achilles and Deidamea could have been as young as eight years old, the two soon became romantically involved to the point of intimacy. 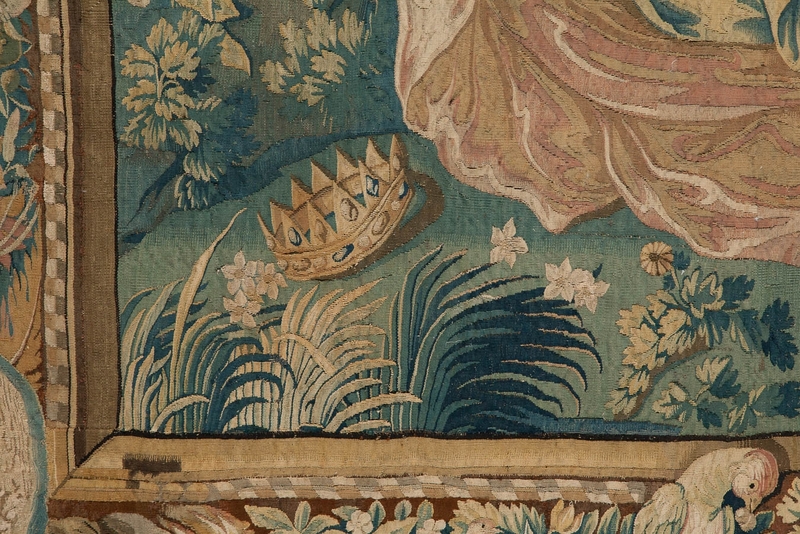 After Odysseus arrived at Lycomedes's palace and exposed Achilles as a young man, Achilles decided to join the Trojan War, leaving behind a pregnant, heart-broken Deidamia.Isaac Moillon, was one of the Louis XIV's painters - 'Peintre du roi'- and produced a number of cartoons for the tapestry industry in Aubusson, which was under Royal patronage. 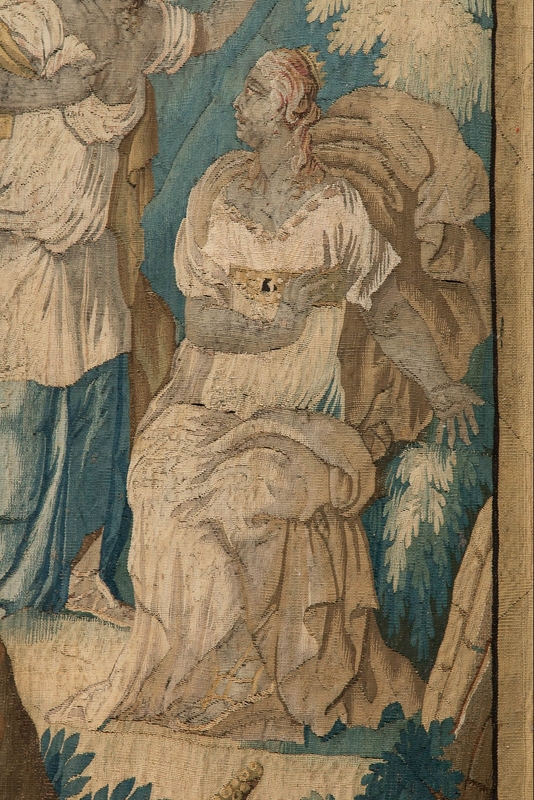 They included the suite of tapestries of the History of Achilles. 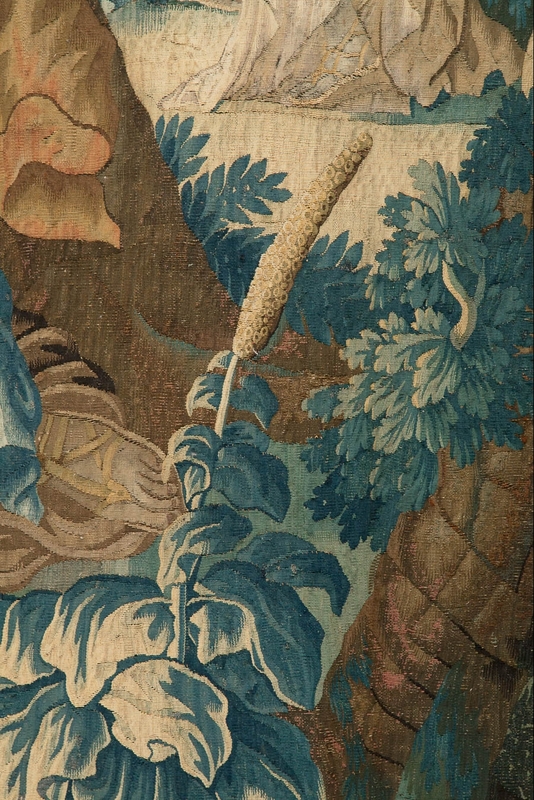 Several of these suites still exist and are conserved in the Swedish Royal collection, the Hospices de Beaune in France, the chateaux of Barbentane and of Villemonteix and in the museum of Aubusson.The tapestry has been re-backed with fine Belgian linen and had conservation work it is in excellent condition. It has been previously lowered in height and there has been past restoration to the top of the border. H. 305 W. 254 D. 1 cm. H. 120 W. 100 D. 0 in.